We interrupt our irregularly scheduled blogging to wish the long-term evolution experiment a very fit 31st birthday! Here are two pictures of graduate student Kyle Card doing today’s transfers, and thereby starting off the next year of their evolutionary journey. Today’s entries in the LTEE notebook are shown below. We also had a visitor who picked up some strains from the freezer over the weekend, and who left us a note on the lab’s whiteboard. We ate a Galapagos-themed cake, shown below, a couple of weekends ago when we celebrated the February birthdays of Charles Darwin, Abe Lincoln, and the LTEE. Thank you Kyle, and thanks to everyone who has ever performed transfers and/or done research on the LTEE lines. Last but not least, here’s a lovely post by Roberto Kolter at Small Things Considered wishing the LTEE a happy birthday! Today is another milestone for the E. coli long-term evolution experiment—the LTEE, for short. I did the 10,000th daily transfer today at about noon. The answer is both yes and no. Let me explain. The LTEE began on February 24, 1988 [1, 2]. From February 24, 1988, to March 13, 2017, equals 10,609 days on which we could have done transfers. But we’ve only had 10,000 transfers. What happened to those other days? In short, the bacteria spent the 609 “lost” days in a freezer at –80°C or in a refrigerator at 4°C. One chunk of days was lost when the LTEE was moved from my lab at UC-Irvine, where I started the experiment, to MSU, where it is today. Moving a lab is difficult: it requires moving people, moving equipment and materials, often renovating space, obtaining new supplies and equipment, hiring new people, and trouble-shooting and otherwise getting everything organized to resume work . We lost 191 days from April 8, 1992, when the 10,000-generation samples went into the freezer at UCI, to October 16, 1992, when the LTEE restarted from the frozen samples at MSU. Most of the other days have been lost as a result of various accidents. I’m often asked, when I give talks on the LTEE, how we’ve kept the experiment going so long without contamination, broken flasks, equipment failure, etc. The short answer is that we haven’t. Many accidents have happened along the way. There are 3 main types of accidents, each of which involves a different sort of interruption and recovery. Little mistakes: Sometimes a flask has a hairline crack; when you take it out of the incubator the next day, there’s just a puddle of salt on the bottom. Or maybe someone knocked over a flask while doing the daily transfers. In cases like these where a mistake occurs that is immediately recognized, we go back in time (and lose) one day. How do we do that? Each day, after the transfers have been made, we don’t immediately discard the previous day’s cultures. Instead, we put them in a refrigerator, where we can use them to restart the experiment after these little mistakes. The bacteria have finished growing long before each day’s transfer, so they are in stationary phase, and their metabolic activity is even lower sitting there at 4°C. Restarting the populations from the refrigerated cultures is a perturbation, of course, but a tiny one in the scheme of things. When these little mistakes happen to one population, we go back a day for all the populations. We do that so that the rhythm of the experiment, which involves quality-control checks and freezing samples at regular intervals, is the same for all of the populations. Bigger slipups: Another sort of problem can occur if the entire experiment is compromised in a way that is not immediately recognized. For example, the autoclave might not be working properly, and we realize that bottles of media that we’ve been using for a few days are contaminated. In that case, the cultures stored in the refrigerator won’t help us. But we don’t have to start the LTEE all over at t = 0. (If we did, then the experiment wouldn’t be here today!) Instead, we go back to the last time that we froze samples, just like we did when we restarted the experiment after the move from UCI to MSU. Importantly, we restart the LTEE from whole-population samples, not individual clones, so that we do not lose the diversity that is present in an evolving population. Of course, moving the bacteria into and out of the freezer is a perturbation, involving the addition of a cryoprotectant, freezing the cells, thawing them, and re-acclimating them to the conditions of the LTEE. Still, it happens only occasionally. Moreover, all of the samples used in competitions or other assays go into the freezer, come out, and are re-acclimated to the relevant conditions before measurements are made. Dreaded cross-contamination: The third kind of accident is when bacteria from one LTEE population “migrate” into another population. That’s not supposed to happen, because it compromises the statistical independence of the populations, which are units of replication on which many analyses rest. I worried about this issue before I started the LTEE, because one of the central questions that motivated the experiment is the reproducibility of evolution. And I’m glad I worried about it. Fortunately, there was a pretty easy way of dealing with this concern from the outset. Six of the 12 populations started from cells of an ancestral strain, REL606, that cannot grow on the sugar arabinose; they are phenotypically Ara–. The others started from cells of a mutant, REL607, that can grow on arabinose; these populations are Ara+. There is no arabinose in the LTEE environment, and the mutation that allows growth on arabinose has no measurable affect on fitness in that environment. However, when Ara– and Ara+ cells grow on Tetrazolium Arabinose (TA) agar in a petri dish, they make red and white (or pink) colonies, respectively. The arabinose phenotype serves two important purposes in the LTEE. First, we use it to estimate the abundance of competitors in the assays we perform to measure relative fitness. To that end, we typically compete an evolved Ara– population sample against the Ara+ ancestor, and vice versa. Second, with respect to the possibility of cross-contamination, we alternate Ara– and Ara+ populations during the daily transfers. The idea is that, if an accidental cross-contamination does occur, it will likely involve adjacent populations and lead to cells that have the wrong phenotype (i.e., produce the wrong-colored cells on TA agar) in a population. So we check each population for that phenotype whenever we freeze samples. When we find one or more cells that produce the wrong-colored colony, we have to figure out what to do. There are various additional checks that we can perform, especially nowadays when DNA sequencing has allowed us to discover many mutations—additional markers—that uniquely identify each population. In particular, these extra markers have, in recent years, let us distinguish between “false alarms” (new mutations that affect colony color on the TA agar) and actual cross-contamination events. In any case, when we’ve had suspected or confirmed cross-contamination events, we restart the invaded population from the previous sample . We then typically monitor that population by plating samples periodically on TA agar, to make sure it didn’t have a low frequency of cross-contaminating invaders even before that earlier sample was frozen. As a consequence of restarting invaded populations, some of the LTEE populations are 500 generations (or multiples thereof) behind the leading edge. So today’s 10,000th daily transfer applies to some, but not all, of the LTEE populations. Despite these precautions and procedures, I worried that somehow we had slipped up and there were undetected cross-contamination events. Maybe there had been an especially fun party one Friday night … and on Saturday someone forgot the protocol and transferred all six red Ara– populations in a row before moving on to the six white Ara+ populations. In that case, a cross-contamination might occur but not be detected. So I was thrilled when we sequenced hundreds of genomes from different generations of the LTEE populations and there was no evidence of any cross-contamination. Have I mentioned all the terrific people who have worked with me? One of the unsung heroes of the LTEE is my technician and lab manager, Neerja Hajela. She has worked with me for over 20 years now, and she’s probably done more daily transfers than everyone else combined. By the way, there were not 12, but 15, flasks in the trays while I was doing the transfers. What’s going on with that? One of the extras is a blank—a culture without bacteria. If the medium in that flask is turbid the next day, then “Houston, we have a problem.” Another of the extras is a population we’re calling Ara–7. It was spun off population Ara–3 after we discovered—many thousands of generations later—that one lineage in that population had gone extinct for some reason that we do not understand. You can read more about that here. Ara–7 doesn’t count as one of the “real” LTEE populations, but it might prove useful in comparison with Ara–3 at some point in the future. And the third extra? Remember what I said about cross-contamination? Well, we recently discovered a cross-contamination event in which cells that made red colonies on TA agar were found among the white-colony-forming cells of the Ara+1 population. Postdoc Zachary Blount confirmed they weren’t new mutants that made the wrong-colored colonies in Ara+1; instead, those cells had specific mutations that showed they came from population Ara–1, meaning they were cross-contaminating invaders. So we restarted Ara+1 from its previous frozen sample, monitored it by plating cells on TA agar, and … alas, up came some more of those red invaders. It’s interesting, in a way, because Ara–1 is one of the most fit LTEE populations, while Ara+1 is the very least fit, which means Ara+1 is especially susceptible to invasion from its Ara–1 neighbor in the daily transfers. Anyhow, we then restarted Ara+1 going back in time 1000 and 1500 generations—hence, the extra flask—and we will monitor those for a while by plating samples on TA agar. If neither of them shows any sign of invaders for several weeks, then we will continue only the one with the fewer “lost” generations and drop the other. There’s one other little issue related to keeping time in the LTEE. 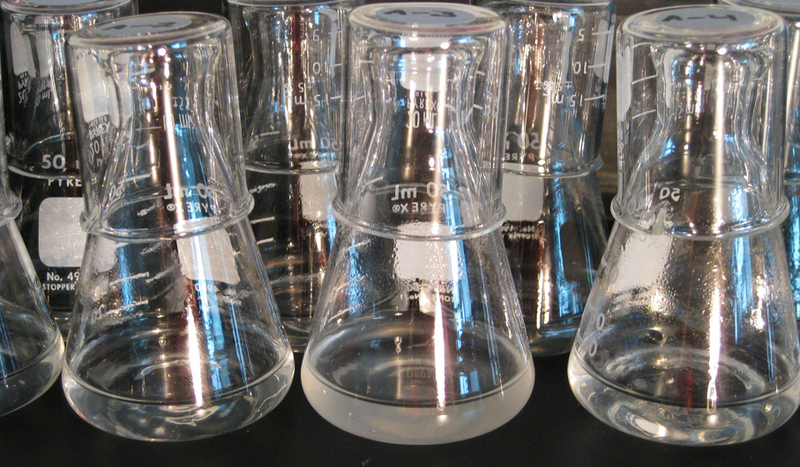 Every day, we remove 0.1 mL from each flask culture and transfer it to 9.9 mL of fresh medium. That 100-fold dilution allows the bacterial population to grow 100-fold before it depletes the available resources. And that 100-fold growth corresponds to log2 100 ≈ 6.64 generations. But we round it up a tad to 6.67 generations, so that every 15 transfers equals 100 generations . In any case, our fielding percentage (baseball jargon for the ratio of plays without errors to total chances on defense) is 10,000 / 10,609 ≈ 0.943. If we exclude the lost days associated with the move from UCI to MSU, then the percentage rises to 0.960. Not bad, not bad at all. Did I mention the terrific people who have worked, and are working, on the LTEE? This post’s title is a play on the novel A Wrinkle in Time by Madeleine L’Engle. I first started the LTEE on February 15, 1988, but I then restarted it on February 24, because I got worried that the first arabinose-utilization mutation I had selected, which serves as a neutral marker, wasn’t quite neutral. So the LTEE experienced a leap day in its very first week! I was fortunate that three experienced graduate students—Mike Travisano, Paul Turner, and Farida Vasi—moved to MSU even before I did to help set up the lab, and that our research was allowed to continue in my UCI lab—led by technician Sue Simpson and John Mittler, who was finishing his PhD—after I moved in late December, 1991. To keep all the populations in sync with respect to the freezing cycle, we restart the others at the same time, too. Of course, for the others, we don’t go back in time—we use the latest sample, where the cross-contaminated population was discovered during the quality-control checks associated with the freezing cycle. In fact, 6.67 generations per day might be a slight underestimate given the possibility of turnover during stationary phase. Moreover, every lineage with a beneficial mutation that sweeps to fixation goes through more than the average number of generations, since each mutant lineage starts as one cell among millions. This past weekend, I celebrated my 60th birthday with friends and family from all over. 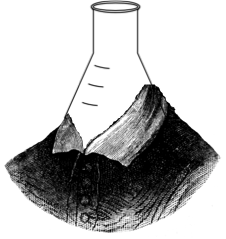 One of the roasters was Ben “The Bard” Kerr, a professor at the University of Washington and colleague in the BEACON Center for the Study of Evolution in Action. Borrowing from another bard, Ben waxed poetic about one of the lineages in the long-term evolution experiment and raised a toast with this Shakespearean flask. Shall I compare Ara-3 to a summer’s day? Thou start more humbly, but sure potentiate. And latecomer’s “fleece” hath all to port citrate. And how was its controlled complex “skin” pinned? Promoter capture, over some time refined. By chance, with nature’s arranging force, trimmed. So long lives this work- and awe is rife, Lenski. This past weekend I had my 60th birthday. I was delighted to celebrate it with wonderful colleagues, students, friends, and family. At a dinner roast and toast, everyone sang When We’re Sixty Four (Thousand), a tribute from the E. coli in the LTEE to the People of the Lab. And several friends came up with new contributions at the intersection of science and culture. This beauty is from Andy Ellington, a professor in the Center for Systems and Synthetic Biology at the University of Texas and a member of the BEACON Center. As background, Andy coauthored a recent paper that helps to elucidate how one LTEE population evolved the novel ability to use citrate. Those who follow the long-term evolution experiment (LTEE) with E. coli know that the most dramatic change we have observed to date is the origin of the new ability to grow on citrate. It’s dramatic for several reasons including the fact (external to the LTEE) that E. coli has been historically defined as a species based in part on its inability to grow on citrate in oxic environments and the fact (internal to the LTEE) that it was so difficult for the bacteria to evolve this ability that only one of the populations did so, and that it took over 30,000 generations even though an abundance of citrate has been present in the medium throughout the LTEE. Even after 64,000 generations, only the Ara–3 population has evolved that new ability. Zachary Blount, formerly a graduate student and now a postdoc in my lab, has spent the last decade studying the evolution of this population and its new ability. His two first-authored papers in PNAS (2008) and Nature (2012) demonstrated, respectively, that (i) the origin of the ability to grow on citrate in the LTEE was contingent on one or more “potentiating” mutations that happened before the “actualizing” mutation that conferred the new function first appeared, and (ii) the actualizing mutation was a physical rearrangement of the DNA that brought together a structural gene, citT, that encodes a transporter and a previously unconnected regulatory region to generate a new module that caused the phenotypic transition to Cit+. These papers presented and discussed much more than these two points, of course, but they are the key findings. More recently, Zack was a coauthor on a paper in eLife (2015) by Erik Quandt, Jeff Barrick, and others that identified two mutations in the gene for citrate synthase—one that potentiated the evolution of citrate utilization, and another that subsequently refined that new function. So we were keenly interested when we saw a new paper titled “Rapid evolution of citrate utilization by Escherichia coli by direct selection requires citT and dctA” by Dustin Van Hofwegen, Carolyn Hovde, and Scott Minnich. The paper is posted online as an accepted manuscript by the Journal of Bacteriology. What follows here are some overall impressions of their paper that Zack and I put together. We may follow these impressions later with some further analysis and comments. Let’s begin by saying that it’s great to see other groups working on interesting systems and problems like the evolution of citrate utilization in E. coli. (iv) genetic context matters—the strain one uses affects the likelihood of evolving the Cit+ function (Blount et al., 2008) and the resulting ability to grow on citrate (Blount et al., 2012; Quandt et al., 2015). The problem, then, is not with the experiments and data. Rather, the problem is that the results are wrapped in interpretations that are, in our view, flawed and fallacious. The authors assert repeatedly (last sentence of their Importance statement, and first and last paragraphs of their Discussion) that “no new genetic information evolved.” However, that statement flatly contradicts the fact that in their experiments, and ours, E. coli gained the new ability to grow on citrate in the presence of oxygen. We would further add (which we have not emphasized before) that these Cit+ strains can grow on citrate as a sole carbon source—when E. coli grows anaerobically on citrate, it requires a second substrate for growth in order to use the citrate (a phenomenon called “co-metabolism”). The claim that “no new genetic information evolved” is based on the fact that the bacteria gained this new ability by rearranging existing structural and regulatory genetic elements. But that’s like saying a new book—say, Darwin’s Origin of Species when it first appeared in 1859—contains no new information, because the text has the same old letters and words that are found in other books. In an evolutionary context, a genome encodes not just proteins and patterns of expression, but information about the environments where an organism’s ancestors have lived and how to survive and reproduce in those environments by having useful proteins, expressing them under appropriate conditions (but not others), and so on. So when natural selection—that is, differential survival and reproduction—favors bacteria whose genomes have mutations that enable them to grow on citrate, those mutations most certainly provide new and useful information to the bacteria. To say there’s no new genetic information when a new function has evolved (or even when an existing function has improved) is a red herring that is promulgated by the opponents of evolutionary science. In this regard, it seems relevant to point out that the corresponding author, Scott Minnich, is a fellow of the Discovery Institute and was an expert witness for the losing side that wanted to allow the teaching of “intelligent design” as an alternative to evolution in public schools in the landmark Kitzmiller v. Dover case. In the title of their paper and throughout, Van Hofwegen et al. emphasize that, in their experiments, E. coli evolved the ability to grow aerobically on citrate much faster than the 30,000 generations and ~15 years that it took in the LTEE. That’s true, but it also obscures three points. First, we already demonstrated in replay experiments that, in the right genetic background and by plating on minimal-citrate agar, Cit+ mutants sometimes arose in a matter of weeks (Blount et al. 2008). Second, rapid evolution of citrate utilization—or any evolution of that function—was not a goal of the LTEE. So while it is interesting that Van Hofwegen et al. have identified genetic contexts and ecological conditions that accelerate the emergence of citrate utilization (as did Blount et al., 2008), that in no way undermines the slowness and rarity of the evolution of this function in the context of the LTEE (or, for that matter, the rarity of Cit+ E. coli in nature and in the lab prior to our work). Third, the fastest time that Van Hofwegen et al. saw for the Cit+ function to emerge was 19 days (from their Table 1), and in most cases it took a month or two. While that’s a lot faster than 15 years, it’s still much longer than typical “direct selections” used by microbiologists where a readily accessible mutation might confer, for example, resistance to an antibiotic after a day or two. So while we commend the authors’ patience, we do not think the fact that their experiments produced Cit+ bacteria faster than did the LTEE is particularly important, especially since that was not a goal of the LTEE (and since we also produced them much faster in replay experiments). However, in a manner that again suggests an ulterior nonscientific motive, they try to undermine the LTEE as an exemplar of evolution. The final sentence of their paper reads: “A more accurate, albeit controversial, interpretation of the LTEE is that E. coli’s capacity to evolve is more limited than currently assumed.” Alas, their conclusion makes no logical sense. If under the right circumstances the evolution of citrate utilization is more rapid than it is in the LTEE, then that means that E. coli’s capacity to evolve is more powerful—not more limited—than assumed. To us, one of the most interesting facets of the evolution of the citrate-using E. coli in the LTEE is its implications for our understanding of the evolutionary processes by which new species arise. Part of the reason for this interest—and the one that’s most easily stated in a popular context—is that the inability to grow on citrate is part of the historical definition for E. coli as a species, going back almost a century. But the deeper interest to us lies not in labeling a new species or debating where to draw the line between species—various criteria are used by different scientists, and inevitably there are many cases that lie in grey areas. Rather, as evolutionary biologists, we are most interested in the process of speciation—the ecological and genetic dynamics that lead to changing biological forms that, over time, are more and more like a new species until, eventually, perhaps far in the future, there is no doubt that a new species has evolved. In short, speciation is not an event. As Ptacek and Hankison (2009, in Evolution: The First Four Billion Years) put it, “[S]peciation is a series of processes, with a beginning stage of initial divergence, a middle stage wherein species-specific characteristics are refined by various forces of evolution, and an end point at which a new species becomes a completely separate evolutionary lineage on its own trajectory of evolutionary change with the potential for extinction or further diversification into new lineages.” We realize that scientists (ourselves included) often use shorthand and jargon instead of writing more carefully and precisely. We have no doubt that one can find solid scientific papers that talk about speciation events; but except for cases that involve hybridization leading to polyploids that are reproductively isolated in a single generation (as sometimes occurs in plants), this is simply an imprecise shorthand. In our first paper on the citrate-using E. coli that arose in the LTEE, we clearly emphasized that becoming Cit+ was only a first step on the road to possible speciation (Blount et al., 2008). One criterion that many biologists would apply to investigate speciation is whether a later form merely replaced an earlier form (evolution without speciation) or, alternatively, one lineage split into two lineages that then coexisted (incipient speciation). In fact, we showed that, after the new function evolved, the Cit+ and Cit– lineages coexisted (and their coexistence was confirmed using genomic data in Blount et al., 2012). We concluded the 2008 paper by asking explicitly: “Will the Cit+ and Cit– lineages eventually become distinct species?” (emphasis added) and discussing how we might assess their ongoing divergence. In conclusion, Van Hofwegen, Hovde, and Minnich have done some interesting experiments that shed further light on the nature of the mutations and ecological conditions that allow E. coli cells to evolve the ability to grow aerobically on citrate, a function that this species cannot ordinarily perform. However, they misunderstand and/or misrepresent the relevance of this system for evolutionary biology in several important respects. Historical contingency is a complicated notion, but it essentially means that history matters. In Blount et al. (2008), we made it clear what we mean by historical contingency in the context of the evolution of the Cit+ lineage in one of the LTEE populations. Was this an extremely rare event that could have happened at any time? Or did it instead depend on the occurrence of a sequence of events, a particular history, whereby an altered genetic context evolved—a potentiated background—in which this new function could now evolve? Roth and Maisnier-Patin’s suggestion that our idea of “historical contingency” may require reinterpretation reflects a false dichotomy between historical contingency, on the one hand, and the effects of different selection schemes, on the other. The fact that evolution might be fast and not contingent on genetic background (though the evidence of Van Hofwegen et al. is, at best, ambiguous in this regard) in one set of circumstances has no bearing on whether it is contingent in another set of circumstances. The historical contingency of Cit+ evolution is not mere conjecture. We showed that the evolution of this new function in the LTEE was contingent. In replay experiments, Blount et al. (2008) showed that that the Cit+ trait arises more often in later-generation genetic backgrounds than in the ancestor or early-generation backgrounds. Moreover, Blount et al. (2012) performed genetic manipulations and showed that a high-copy-number plasmid carrying the evolved module that confers the Cit+ function had very different phenotypic effects when put in a Cit– clone from the lineage within which Cit+ evolved than when placed in the ancestor or even other late-generation lineages not on the line of descent leading to the emergence of the Cit+ bacteria. In the clone on the line of descent, this module conferred strong, immediate, and consistent growth on citrate. In the other genetic backgrounds, growth on citrate was weak, delayed, and/or inconsistent. 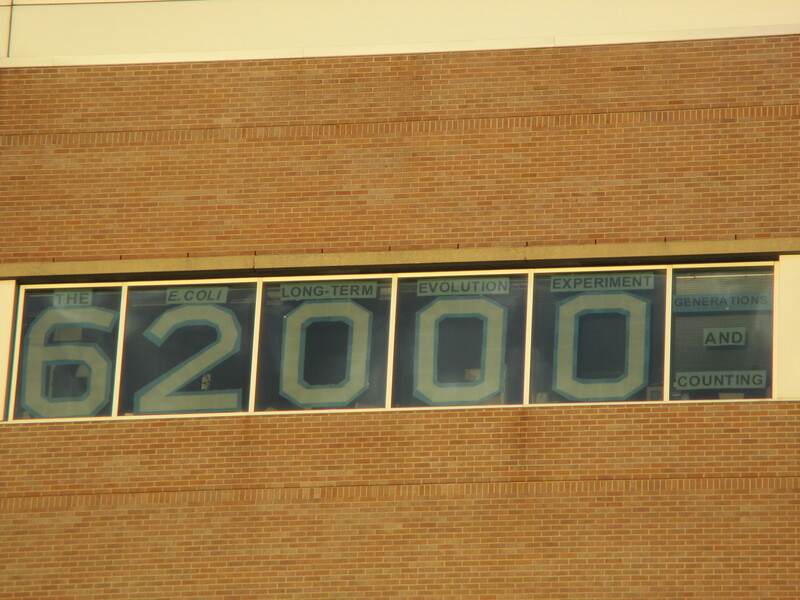 Ever wonder about those big numbers posted in a window in that tall building on the east side of Farm Lane, across from the entrance to the MSU Dairy Store? 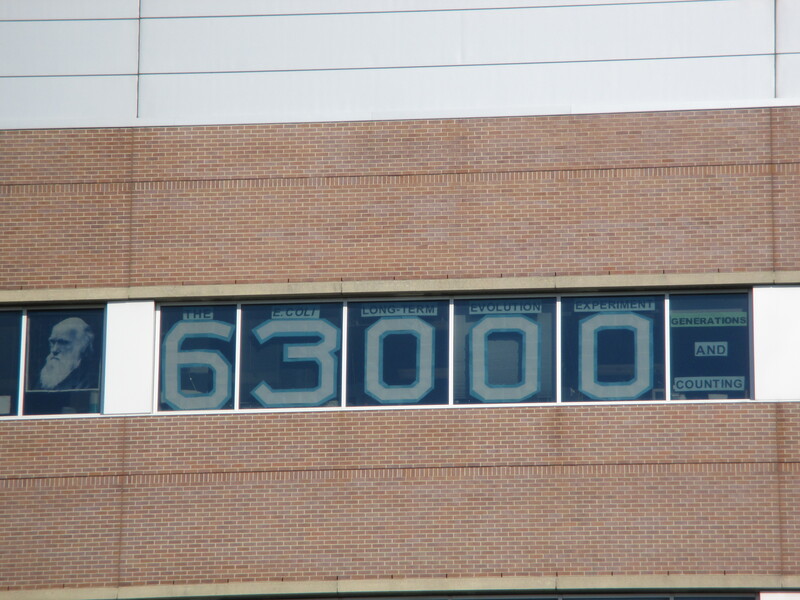 Right now, the digits read 63000. That’s the number of generations in an experiment that’s been running in my lab for over a quarter century. We call it the LTEE, which stands for the Long-Term Evolution Experiment. There are 12 populations of E. coli bacteria in the experiment, and they all started from the same strain. Now consider a bacterial cell that gets a mutation in its DNA that lets it acquire more food and grow a little faster. That cell will leave more descendants than its competitors—that’s adaptation by natural selection. Over time, the bacteria are becoming stronger and fitter in their flask-worlds. By watching the 12 populations evolve, we can answer questions about the dynamics and repeatability of evolution in a group of organisms—bacteria—that are essential for life on Earth as well as important players in health and disease. We measure the growth rates of the bacteria, we sequence their DNA, and we see just how much evolution can achieve even in short order. Oh, about the sign. Zachary Blount is a talented postdoc who works on this project, and he likes to have fun with science. He put up the window display which, if you look closely, has a picture of Charles Darwin on the left, “The E. coli Long-Term Evolution Experiment” over the number, and “Generations and Counting” to the right. Every 1,000 generations or so, Zack updates the sign. Note: This piece first appeared at eastlansing.org after an invitation from Alice Dreger to explain the numbers in the window to our community. The window to the lab has been updated, courtesy of Zack Blount.